20 Years since Linoleum Dissent single released! Can’t believe it’s 20 years this week since the first Linoleum single, Dissent, came out in its gorgeous lino sleeve cut up by the band members. 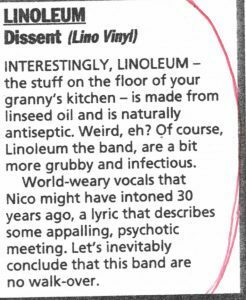 Dissent reached number 4 in the indie charts and received the review below in the NME on 27 April 1996. Wow I can’t believe its been 20 years. I was scrolling thru my files, came across your album and put it on. I remember playing “Dissent” on my college radio show that was dedicated to all things Brit Rock. Thank you for such a great release and I won’t go so long without listening to it again. Good to hear you still listen to Dissent – thanks for letting us know!